Ethnikids’ aim is to ignite a love of reading in children by making it fun, and also affirming and empowering children with material that they can relate to. Ethnikids wants more children to be excited about reading and have more access to great diverse storybooks. We want to build a reading nation. We assist in achieving this by bringing the books to life with ‘Meet the Author / Book Reading’ sessions. These sessions allow our independent authors to become household names as we give them access to a bigger platform and different audiences. We believe that it is important that South Africa and its communities celebrate and promote its languages by exposing and celebrating those languages with children. We believe that in order to preserve our languages, we should do so by ensuring that we expose our children to them. The best way to promote, celebrate and preserve South African languages is through the African child. Ethnikids will do this by hosting a book reading at Eldorado Park Library, Gauteng, South Africa. 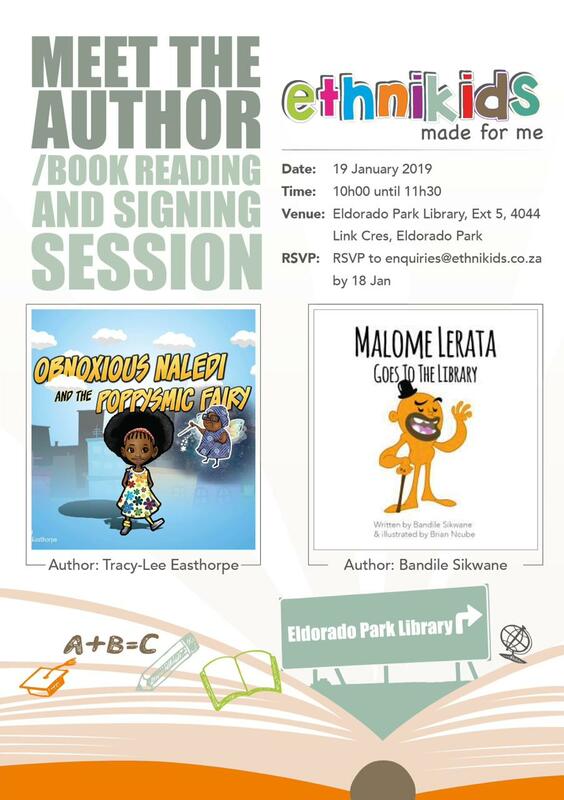 Authors, Tracy-Lee Easthorpe and Bandile Sikwane will be reading their books ‘Obnoxious Naledi and the Poppysmic Fairy’ and ‘Malome Lerata goes to the Library’ to children in this community. These books feature characters of colour that they can identify with and have stories that they can relate to. This will not only encourage love for reading but will also promote self-love and love for South African languages, as one of the books has been written in Setswana. We hope to not only encourage love for reading in children but to also promote self-love in these children by exposing them to books that they can both relate to and identify with. In doing so, we hope that we as Ethnikids would have played a role (even though small) in increasing literacy levels in South Africa. This will assist in the preservation of our South African languages and cultures and thus our customs, beliefs and identity as a diverse African nation.